Dennis DuVal was a flashy point guard who combined substance with style, to become one of the top scoring players in Syracuse history. When he graduated he was second only to Dave Bing in career points. 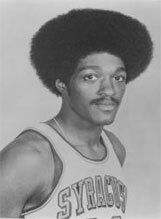 'Sweet D' averaged 19.2 ppg on the freshman team in 1971, along with 7.7 rebounds. He made a big splash when he joined the varsity in 1972, scoring 15.8 ppg, giving Syracuse a 40 ppg backcourt with DuVal and Greg Kohls. DuVal would lead the team in scoring and assists as a junior, on their way to a 24-5 record. As a senior, he would once again lead the team in scoring at 20.6 ppg. He scored a lot, and grabbed a lot of rebounds for a player his size, though DuVal consistently seemed to avoid going to the free throw line. He set the Syracuse record for field goals in a game with 18 against Bucknell in 1974, giving him 37 points for the game. He would have scored more, except he had only one free throw in the game; this was consistent throughout his career as he average slightly over 3 free throw attempts a game in his career. DuVal was always a flashy player, but coach Roy Danforth saw him goofing around with trick plays during practice. A showman himself, Danforth had DuVal create a pre-game 'show' that would entice the fans as the Orangemen warmed up for each game, which DuVal would do during his three years on the varsity. DuVal would be 3rd team All-American his senior year. He would be drafted in the 2nd round by the Washington Bullets of the NBA, and the Denver Nuggets of the ABA. He played two years in the NBA, one with the Washington Bullets and one with the Atlanta Hawks.from 1975 to 1976. Following the conclusion of his basketball career, DuVal became a police office in Syracuse. In 1990 he became the deputy police chief, and in 2001 he was named the Syracuse police chief. DuVal was recognized as being an outstanding police chief, and resolved several issues regarding gang violence in the city, and improved the racial relationships between the black neighborhoods and the police force. DuVal retired from the police force in 2004, after a 26 year career in the Syracuse Police Department. DuVal was named to the Syracuse All Century Team in 2000, and inducted into the Syracuse Hall of Fame in 1994. He received the Vic Hanson Medal of Excellence in 1984, and was named a Letterwinner of Distinction in 1997.